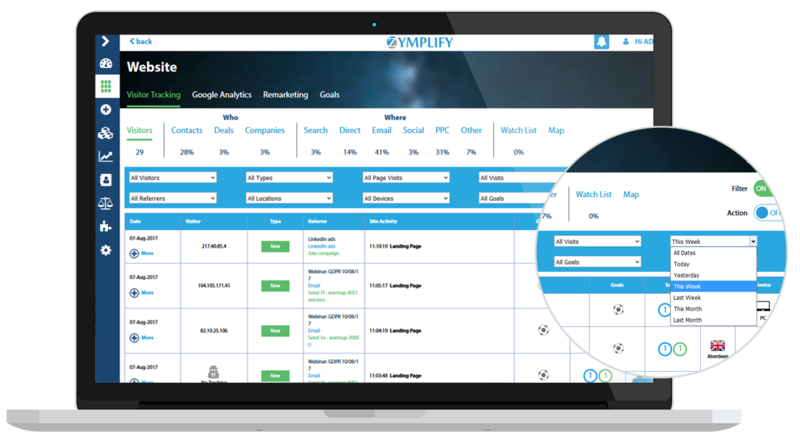 With our website tracking, you have the ability to not only see how many people are coming to your website each day, but to have this broken down on an individual basis. See whether they are new or returning visitors, the number of pages they have viewed, and a breakdown of the actual pages they visited. With additional information such as device it was viewed on, and their geographical location, you get a full view of your website visitors. If your website visitor is a contact or a deal within your dashboard, we have the ability to match this visit to the correct individual using their IP address. Producing a breakdown / history of all the interactions that particular contact has had with your company i.e Website Visits, Emails Received, Engagements etc. 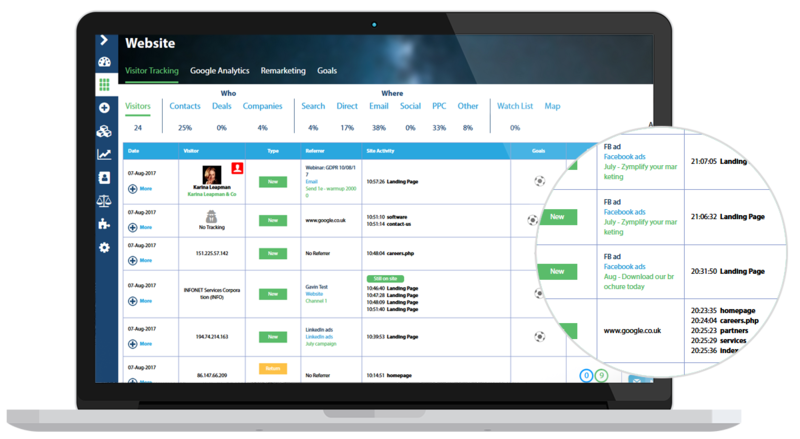 This allows you to see at a glance, how interested your contacts are in your product/service based on their level of interaction, as well as the opportunity to turn them into a sales lead. Our website tracking can allow you to create personalised goals for your website. I.e If someone goes to your pricing page, we can assign the visitor 5 points. This allows you to keep track as to how many visitors are completing your goals, as well as associate the goal to the correct individual. 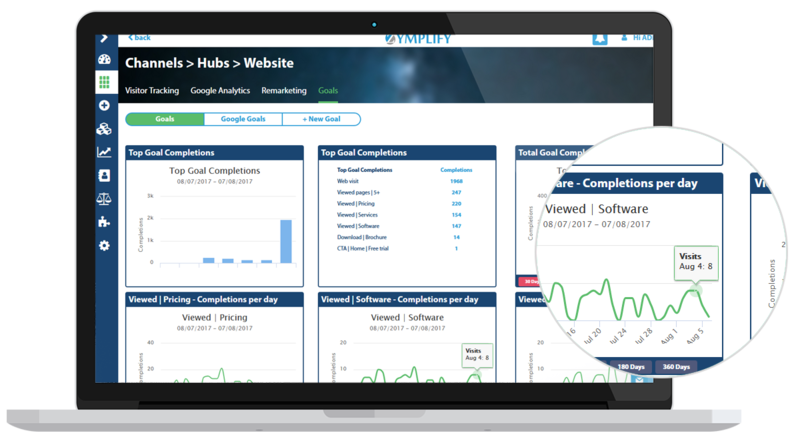 By activating goal scoring, it gives you the ability to see which visitors could be potential prospects based on their total score. Why not add these visitors to a watch list and get easy access to see if they return to your site again? Make your website more trackable and find out what's working best on your website. Only interested in seeing your highest quality of website visitors? Activate the filtering option, and only preview the website visitors that match your criteria. I.e Show me visitors from the last week, or viewed more than two pages and has a score greater than 10. This helps you identify quickly the visitors you should be focused on, and whether they should be added to your "Watch List", to ensure you don't miss them if they come back to your website again. 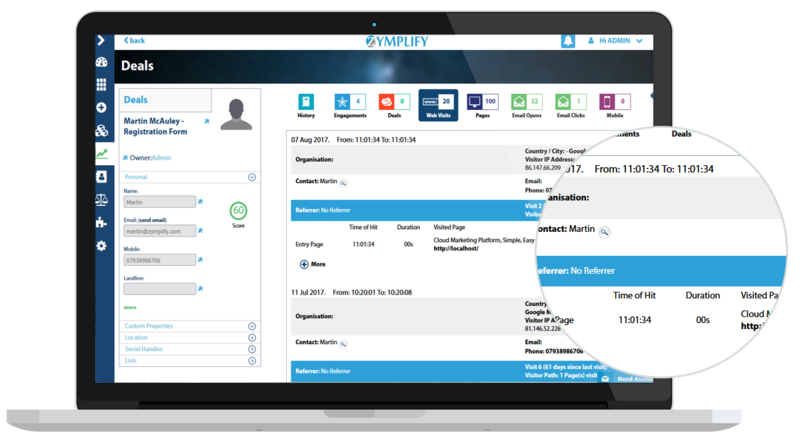 Having launched an email campaign through the platform, and having the tracking code included on your website, you have the ability to track whether people open your emails and jump across to your website. See the individual email campaign the visitor received and where they navigated to on your website. This helps you identify the key areas your contacts are interested in, and what may be relevant for future campaigns.